FORT LAUDERDALE, FL, April 28, 2016	(Newswire.com) - Jenna Mollard knows business and she knows event planning. These two professional attributes, as well as much experience in working with non-profit organizations, are precisely why she is a most welcome addition the Winterfest advisory board. Mollard, in charge of identifying potential deals and strategic partnerships in the community at Rand Internet Marketing, possesses the leadership qualities and business savvy that are ideal for helping Winterfest, Inc., the non-profit organization behind the annual signature event of the holiday season, the water-front spectacular known as the Seminole Hard Rock Winterfest Boat Parade, become an even bigger and better success. The event has been named a “10 Best” holiday event by USA Today readers, among other accolades. She is already hard at work on that task, helping with an event held by Winterfest and the Marlins to introduce their new General Manager Don Mattingly to business leaders from Broward County. “I’m very excited and proud to have joined forces with such an amazing group like Winterfest,” says Mollard. “They have long been an exemplary organization in Broward County, and have done much to promote activism and encourage connectivity in the local community.” Winterfest’s economic impact on the community is estimated at more than $50 million per year, with the organization itself spending more than $1 million in Greater Fort Lauderdale alone. This year’s event will take place on Saturday, December 10, 2016 starting at 6:30 p.m. along the Fort Lauderdale New River, traveling along the Intracoastal Waterway north to Lake Santa Barbara in Pompano, covering approximately 12 miles. The theme will be “Comics and Cartoons” for the event’s 45th anniversary. The year-round efforts of the organization serve to help other non-profit organizations in the community, with the help of area restaurants and private parties which serve to raise funds for support. For example, the Jessica June Children’s Cancer Foundation managed to raise approximately $25,000 during Winterfest. In addition, the organization works with Broward County non-profit organizations to nominate a child best representing their services as Winterfest Junior Captain. The nominees promote the non-profit organization during a social media competition. Notably, Winterfest hosts a yearly student art competition where budding local artists are encouraged to create and submit drawings of a fantasy boat they would like to see in the parade. Winterfest hosted more than 660 guests at a recent reception to honor these students from 40-plus Broward County schools. Paddleboards, kayaks, Private boats, giant showboats, and corporate mega-yachts will be strewn with thousands of festive lights, adorned with themed décor, offering music and entertainment for viewers, including appearance by local and national celebrities, civic leaders and more. The parade is expected to be viewed by millions of people, many along the parade route and most via television. Rand Internet Marketing was founded in 2010 as a division of Rand Business Services and is based in Fort Lauderdale, FL. A truly full-service marketing agency, Rand offers a full line of design and front / back end services, including responsive web development, search engine marketing (SEM), search engine optimization (SEO) and pay per click (PPC) marketing. They also offer and social media marketing, logo design, and graphic design services. Additionally, Rand specializes in professional e-commerce web design and development, including the build out of WordPress and Magento sites, and mobile website design and development. Rand also offers video production and marketing, full color printing, reviews and reputation management, professional product photography, and a host of other business services. For more information, call them toll-free at 888.707.RAND (888.707.7263) or request a free consultation online at http://randmarketing.com/request-consultation. Seminole Hard Rock Hotel & Casino in Hollywood, Florida, located minutes from Fort Lauderdale’s world-famous beach, features a AAA Four Diamond resort with 469 luxury rooms and suites, award-winning restaurants, high-energy nightlife, a lagoon-style pool and Beach Club, a Hard Rock-inspired spa, and premium meeting and convention space. As South Florida’s premier entertainment destination, Seminole Hard Rock hosts top-name acts at its 5,500–seat Hard Rock Live concert arena and offers more than 100 table games, 2,000 of the most popular slots and a stand-alone poker room. Fine dining options include Council Oak Steaks & Seafood, the resort’s signature steakhouse, and Kuro, a luxe and socially vibrant restaurant offering new-style Japanese cuisine. The resort also features contemporary and casual eateries, including Blue Plate, the hotel’s 24-hour diner-inspired restaurant; Constant Grind, a gourmet coffee and pastry shop; and the ever-famous Hard Rock Cafe - Hollywood, part of Hard Rock’s 163 globally recognized rock ‘n’ roll restaurants. For more information, call 800.937.0010, visit us online at www.seminolehardrockhollywood.com, or like us on Facebook /SeminoleHardRockHollywood, and follow us on Twitter and Instagram @HardRockHolly. 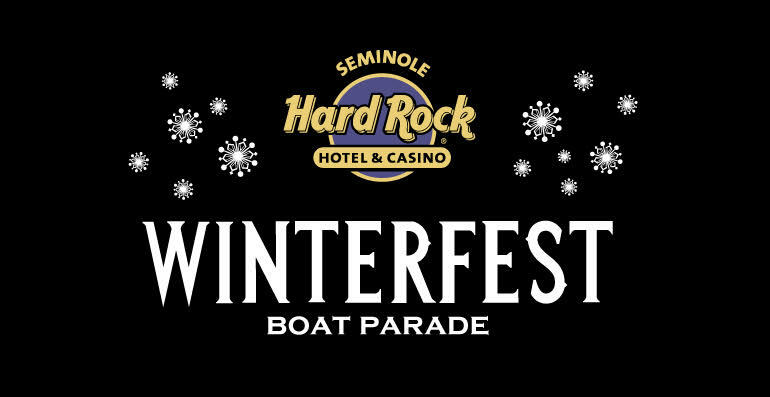 Winterfest is a Florida not-for-profit organization based in Broward County that produces a variety of events including the free public event known as "The World’s Most Watched Boat Parade." Millions via television and approximately one million spectators view the Parade on the 12-mile route. Winterfest also hosts annual events to enhance the community’s image and provide unique, wholesome family entertainment. For more information on Winterfest, please contact the office at 954.767.0686 or their website: www.winterfestparade.com.